They say, and I quote: "We reckon' there are almost as many Barbies in the world as there are fish, because Scott at invoman.com said there is, we reckon'." I can hear it now. It becomes a chant. A chant throughout this wonderful fishery we have. For every fish a Barbie, and for every Barbie a fish. I'm sure many of you fathers out there have done the ritual flushing the last pacifier down the toilet, haven't you? Not to mention the extinguishing of the night light because the monsters aren't real? And who, as a father, can forget the night you finally turn off the heat in the child's room and leave the window open in January to save on electricity? Oh, the joys of fatherhood! As you can see, RECKONING Magazine has it correct. I am depressed, my daughter, who is 2 years, 3 months old used to read/look at fishing magazines while she was potty training. All of the sudden: she NOW wants her 'Barbie Dolls'. I am considering writing a protest letter to the appropriate authorities for delivering such a deterrent to a universal pastime such as potty-training...but would MATTEL listen? Barbies are not toilet material. PERIOD. Granted, Barbies are playground, daycare, 'night-night stuff' and plain old 'here, take this and go play' props, but TOILET TRAINING material? Mattel has some answering to do. Does Mattel even HAVE a 'fisherwoman Barbie'? If they do, they don't advertise it. Maybe Mattel is using 'fisherwoman Barbie' as a write-off for taxes? Hmmm...? Maybe the IRS should know about this UNADVERTISED 'fisherwoman Barbie'...?? I'm SURE an audit of Mattel's records are in order. This unadvertised 'fisherwoman Barbie' is nothing more than a plot to undermine the naturally talented fisherwoman/toilet trained women out there. Barbies don't even have BARBS! And yet they are 'hooking' all our young toilet-training females! WELL....other fishermen fathers? What can we do about this insanity? 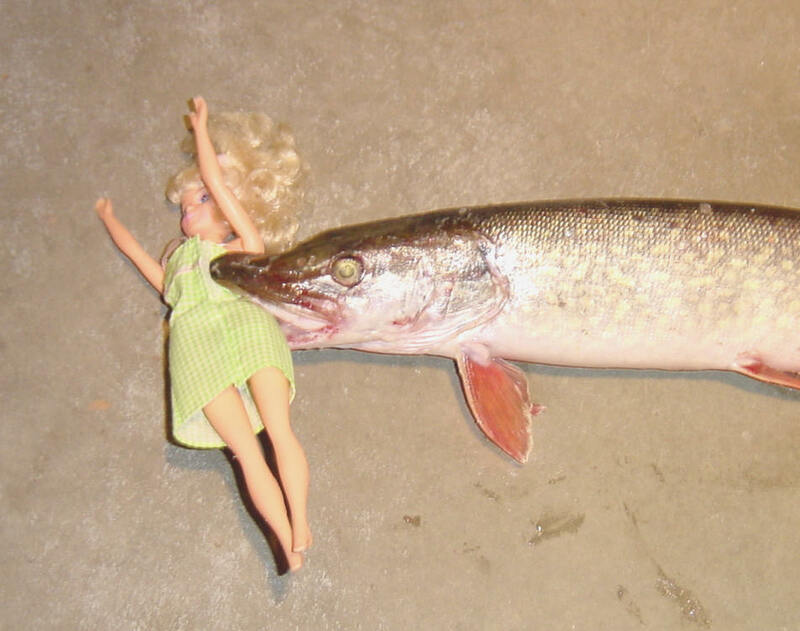 INSIST they release the 'fisherwoman Barbie' to the public? Get the IRS to crawl all over them? What can us fathers do? Why would any good father give his child a Barbie, when there are starving fish in the world? Please send your donation to scott@invoman.com. Currently we are only receiving Barbies as donations to the P.H.O.N.Y. fund, but we hope to begin receiving 'Tickle Me Elmo's' in the future.